View of Del's Retreat from Tranquility Lane. Del's Retreat Cabin is the first cabin on the right. Wheelchair access on opposite side. Each cabin has its own firepit & grill. We invite our guests to use the new fireplace when conditions are dry. Del's has a charcoal grill. Please bring your own charcoal and lighter fluid. 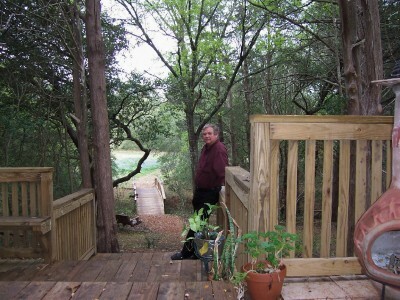 Del on the deck of Del's Retreat looking out toward the bridge. Del's Retreat Cabin is so popular it is often booked a year in advance (especially for antique weekends)! $100 during the week, $115/night weekends. **Limit 3 persons in Del's. ** Three night minimum during Antique festivals and holiday weekends. **On single night stays, please add $10 to the above prices. **The prices quoted are double occupancy and are subject to hotel tax. **There is a $15 charge for extra persons including children over 2 and $35 extra per person per day during Antique Festivals. **We offer reduced rates for extended stays of 3 nights or more. We also offer ACTIVE MILITARY discounts. Repeat customers or multiple cabin rentals also receive a discount except for Antique festivals & holidays. Please ask for quote. ** Prices quoted are cash or check. Payment in full is expected two weeks in advance of reservation. Payments by credit card can be made through advance billing by Paypal at a small administration charge. Please review our policies by clicking here. Making a reservation with Trails West Retreat constitutes acknowledgement of and agreement with the rules and waiver of liability. Children love Trails West Retreat! We are pet and family friendly. However, in an effort to keep our prices low and for conservation purposes, we encourage our guests to get several uses out of the towels. We furnish one towel per person per day (double occupancy unless otherwise added pay). If you require more towels, please furnish your own. Trails West Retreat does not provide maid service. If you use the dishes and utensils that we furnish and choose not to wash them upon leaving, there will be a $25 housekeeping charge added to your bill. Smoking is NOT allowed inside any of our facilities. Creek view just down from Del's Retreat Cabin. Contact us for reservations today!